Could you describe the mission of your new company, Cinq&Co., and the services you offer? Cinq & Co. is a full-service agency for American companies seeking expansion into Parisian markets. Our expertise is in culturally informed communications, marketing, and events. We leverage our well established and diverse networks to connect you with the resources and customers that you need, and we can help you devise strategies and execute campaigns to achieve your objectives. Could you tell us a bit about your background? How did you end up in France? I grew up in Washington, DC but moved to France for my senior year of high school through a program called School Year Abroad in Rennes. After graduating from Georgetown University’s School of Foreign Service, I made my first attempt at moving back to France but quickly returned to America to work for the Presidential campaign of Barack Obama in March 2007 – when he was still very much a long-shot candidate. After 20 months in Chicago and the victorious election, I moved to DC for nearly a year and then to Paris to work for President Obama’s Ambassador to France and Monaco, Charles Rivkin, as the Chief of Staff of the Ambassador’s Residence. I decided to return to the States for one more campaign and to help re-elect President Obama. Then I decided to launch Cinq&Co. and am now going back and forth between Paris and New York! Do you recall the moment you realized you were truly a Francophile? The first time I came to Paris I was 14. My mother and I couldn’t sleep due to jet lag, and I remember wandering around St.-Germain-des-Pres where we were staying at one o’clock in the morning thinking that I had never seen such a beautiful and lively city that simultaneously felt comfortable and familiar while remaining different, exciting, vibrant and cosmopolitan. The next day I asked my mother if we could stay in Paris longer than planned and we spent the full 10-day holiday in the city. I knew then that I would return to France and make my life here. It just felt so natural and was where I wanted to be (and still is to this day). What is it about France that keeps you here? Living with a French family my senior year of high school gave me the roots and family ties to the country that continue to this day. I’m as close to my French family as I am to my biological family. And my French siblings are starting families so I have two nieces and a nephew with another one on the way…and watching them grow up is so important to me. Being able to spend holidays with a family while living and working in France and in the States is incredible and I thank my lucky star every day for bringing my French family into my life. I cannot imagine life in France any other way. How did you decide to start your own business? Cinq&Co. is the result of many months of meditation and reflection on what I need to do to realize my dream: work for myself to allow for maximum flexibility, travel, freedom, but with a solid presence in France and the United States. As a US-based consultant specializing in services directed towards companies, individuals, cultural institutions and non-profits looking to either re-locate, expand market share, raise awareness or raise funds and profile in France and throughout Europe, Cinq&Co. is uniquely positioned to assist American and multi-national companies with all of their various needs in France. Have you encountered any difficulties in starting your own business in France? Cinq&Co. is just being launched this month, and while I certainly plan to expand in both the US and France in the near term, I have not yet begun the process of allowing the company to have a permanent presence in France – so I will be looking for advice and suggestions on what and what not to do! Please email me any tips or suggestions at Daniel@cinqandco.com! Could you tell us a bit about some of the current projects you have undertaken through Cinq&Co.? I am working on a number of projects for a variety of clients at the moment, from events during the Democratic National Convention in Charlotte, NC, to an event in Paris on November 20th with two clients – Pixelis Design and Yellow Pedicab Ltd. – that combines the best of corporate social responsibility and principles of sustainable development, great urban art and global design, brands and companies! I am very honored and excited for the partnership and hope you will join us at the vernissage on November 20th at the Espace Pierre Cardin on avenue Gabriel. I know that you have been heavily involved in Democratic Party politics and specifically fundraising and event planning over the last five or six years. What can U.S. citizens of either party who are living abroad do to get involved in this year’s presidential campaign? And what can we do even in non-election years to stay connected to the U.S. political scene? US citizens can first and foremost get involved by joining the equivalent of their state party, Democrats Abroad – which is led, in France, by my friend and mentor Connie Borde. Connie gave me The Audacity of Hope, which helped inspire me to move to Chicago to join the campaign in March of 2007. And secondly, as a fundraiser, I would encourage everyone to host or contribute to the campaign directly by either hosting a house party and raising awareness of how to vote from abroad, to attending an event organized by the campaign like the one we organized with Anna Wintour in Paris on October 1st. What are your goals for future projects for Cinq&Co. in the short to medium-term? Cinq&Co. will take me back and forth between France and the United States until we get enough clients and work to settle into a more regular routine. So the first goal is to secure enough contracts to expand within the first year, and then to work on several exciting events next year, which will be announced by the end of the year hopefully. Due to the nature of our services, I cannot disclose the details at this time…but I will just say, ‘stay tuned’! Could you share one “insider’s tip” with us for someone looking to do business or hold an event in France? Hire Cinq&Co.! But seriously, my advice for anyone looking to do business or organize an event in France is to find someone they want to work with that has the experience and contacts necessary to make their experience as smooth and successful as possible. There are many companies out there offering a variety of events-oriented services. Only Cinq&Co. is a full- service company that can meet every need you may have so that we truly are a one-stop-shop! Could you share one “insider’s tip” with us for someone traveling to France in the coming months? My tip to someone visiting France in the coming months is: read this blog! And get off the beaten path. Try something new. Paris is a big city and it is constantly re-inventing itself. So explore a new neighborhood or try a new hotel. Don’t go to only the restaurants you read about in the NYT. But take a recommendation from Abby or another local and trust that we know what we’re talking about! My motto for urban traveling: Excite the senses. Explore the city. Enjoy the experiences. And of course – bon appetite! 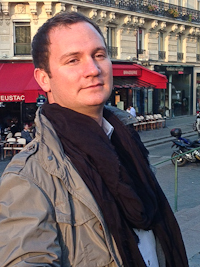 Thank you, Daniel, for sharing your story and your insights with Paris Weekender!